SEOUL - Donald Trump's much-trailed announcement of a meeting with North Korean leader Kim Jong Un later this month in Vietnam sets up another box-office summit between the two mercurial leaders who were once bitter verbal enemies. As Trump and Kim prepare for their second date, here are some key quotes from their relationship, from brinkmanship to one of the world's most unlikely bromances. "We can't let a madman with nuclear weapons let on the loose like that," Trump told Philippines President Rodrigo Duterte during a phone call in April 2017, shortly after taking up residency in the White House. "We have a lot of firepower, more than he has, times 20 -- but we don't want to use it." In September that year, in his debut speech at the United Nations, Trump dubbed Kim a "rocket man" on a "suicide mission." "Rocket Man is on a suicide mission for himself and for his regime," Trump added. "The United States is ready, willing and able." Kim shot back, vowing to "surely and definitely tame the mentally deranged US dotard with fire. A frightened dog barks louder." On the heels of an intercontinental ballistic missile test by Pyongyang in November 2017, Trump derided Kim as a "sick puppy," drawing cheers from a crowd of supporters at a campaign-style rally. Kim welcomed in 2018 with a New Year address in which he warned he had a "nuclear button" on his table. The North's official party newspaper dismissed Trump's "swaggering" as nothing but the "spasm of a lunatic" frightened by North Korea's power, and the "bark of a rabid dog." In May, Kim released three American citizens detained in North Korea, which Trump hailed as a "positive gesture of goodwill". Trump later said that "everyone thinks" he deserved a Nobel Peace Prize for his contributions to warming US-North Korea relations. Following their Singapore rendezvous a month later -- which the pair's matchmaker, South Korea's President Moon Jae-in, dubbed a "miracle" -- the US president said that he and the North's leader had fallen "in love". 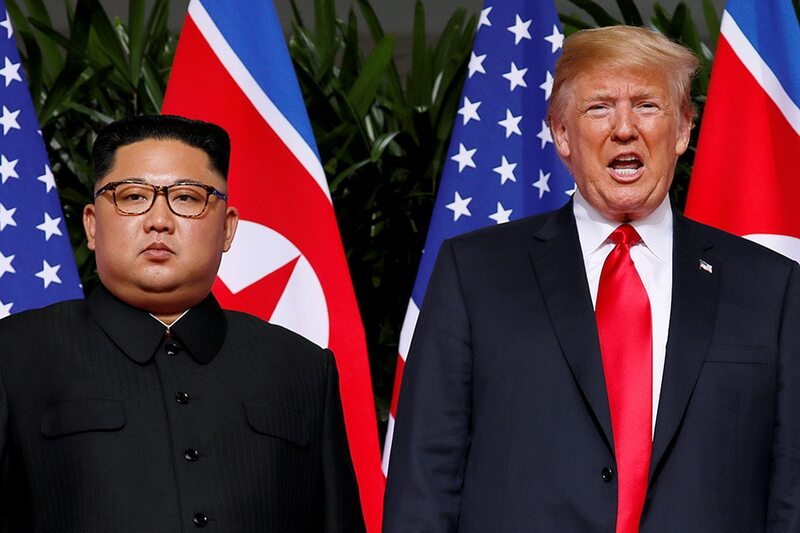 Even as the two sides sparred over the exact meaning of the vaguely-worded Singapore declaration, with Pyongyang accusing Washington of "gangster-like" behavior, Trump boasted of his rapport with Kim, who he said had proclaimed his "unwavering faith" in the US president. "We will get it done together!" Trump wrote on Twitter in September. In his State of the Union address Tuesday, Trump boasted of his diplomatic prowess, saying if he had not been elected the US "would right now, in my opinion, be in a major war with North Korea." Just a few days earlier, he said Kim had the chance to turn his impoverished state into "a tremendous economic behemoth." "I like him. I get along with him great," the president said. "We have a fantastic chemistry."